The ultimate D*mble Clone!!! 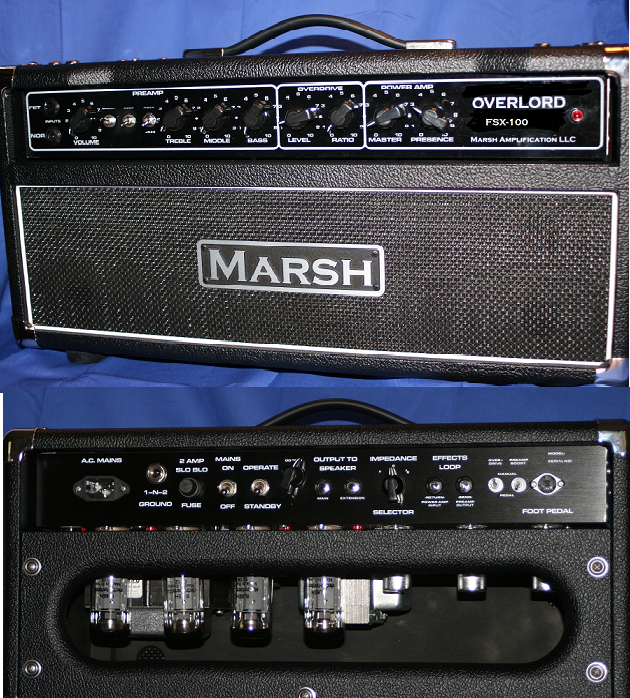 Finally an affordable replica of the amazing amp used by many top guitarists worldwide. The FSX-100 provides immaculate clean tones, a complex overdrive tone (with drive and level controls), a passive effects loop, a half power switch and switchable output ohm selector. Four matched 6L6GC's used in the output section and three 12AX7's make up the Preamp, Overdrive and Phase Inverter stages. 2-button fooswitch controls Channel Select and Preamp Boost. front panel controls include bright, Mid boost and rock Jazz switches along with OD level and ratio & Master Volume and Pressence. two inputs: Normal and FET (set for clean boost). We have recently added an external Overdrive trim and negative feedback switch on the rear panel to give the user even more tonal options! The circuit is widely used by boutiques charging twice as much, but now you can own this incredible amp at a great price. Like all Marsh Amps, the FSX-100 is Hand Wired one at a time and use high quality components including Orange Drop Caps, Teflon wire, and US. Made Transformers!! !